As an alumnus of the Center for Creative Leadership, I learned a long time ago that constructive feedback is one of the most precious gifts we can receive. When given appropriately, it means that someone cares enough about us that they want to help us get better at something. In the two previous articles, Does Your Elevator Speech Go to the Top Floor and Nailing Your Elevator Speech Delivery, we learned how to construct and deliver a great elevator speech. At the end of the second article, I asked, "How do you achieve such a high level of excellence in your delivery?" The answer: PRACTICE, PRACTICE and PRACTICE. Ask someone to critique you and then…PRACTICE AGAIN! This time I underlined "Ask someone to critique you" to emphasize the importance of obtaining someone's input to help you perfect the most important 60-second speech you'll ever present. In general, a critique analyzes, interprets and evaluates your elevator speech, answering the questions how? why? and how well? A critique is not necessarily to criticize your pitch in a negative sense. The evaluator's reaction to your speech may be largely positive, negative or a combination of the two. It is important to understand why they respond in a certain way and adjust your delivery to eliminate negative perceptions. In Toastmasters, we learn to evaluate any speech using the sandwich method of compliment-criticsm-compliment. Keep this in mind if you are evaluating someone else's elevator speech. Always be civil in what you say. My wife and daughter are wonderful critique partners. They bring certain skills to the table that encourage me to improve in different ways. I can say with confidence that they are a blessing to me and I wouldn't be where I am today without them. Why? Because I know that they have my best interests at heart. Whomever you select as your critique partner, trust that they have your best interests at heart. Conduct the rehearsal in a no-distraction environment. Remove all excuses for not making the best impression possible. First perform the rehearsal and critique standing up, then try it sitting down. 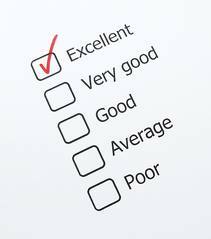 Grade the rehearsal on a scale of 1 to 5 with 1 being Poor and 5 being Excellent—meaning no errors at all. Grade 4 = one error. One error is Very Good and typical for most professionals. Grade 3 = two errors. Two errors is Good and typical for someone who needs to practice more. Grade 2 = three errors. Three errors is Average and means that someone needs real quality time practicing. Grade 1 = four or more errors. Four or more errors is Poor. Someone is either not prepared or very nervous. It's important for the evaluator to document his/her observations. It won't be possible to remember everything they see or hear. The table below is a suggested format for documenting the rehearsal observations. Tailor the form as you desire. As a final note to the evaluator—BE HONEST! You will not be helping your colleague if you don't make them aware of their errors just because you want to be nice. Offer constructive feedback and avoid being rude or insulting. Ask the question or state motive? Did they speak in complete sentences? Did they ramble or lose focus? Did they stand or sit up straight? Did they maintain eye contact while speaking? Did their hands or fingers wander about or move in a distracting manner? Interesting and invaluable suggestions. But not many people like/subscribe to this idea and therefore hate constructive criticism. If you allow, I would like to repost this blog on my portal with due credits and link back to your blog.